Rent Control has been Berkeley's single most controversial issue. It was on the ballot for the first time in June 1972, when this silkscreen poster expressed the sentiments of most Berkeley tenants. The Rent Control Initiative passed, only to be declared unconstitutional by the California Supreme Court. 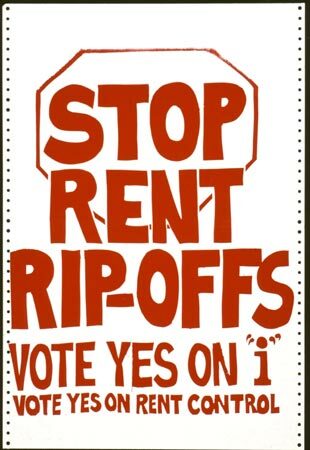 Rent Control would be back on many later ballots, including 1977, 1978, and 1980. Rent Control has always been the great dividing line between Berkeley's two rival political coalitions. The left, including Berkeley Ctizens Action, supports it, while the moderate/conservative block has fought Rent Control since 1972. From 1978 on, Berkeley has maintained a form of Rent Control, although landlords greatly weakened it through state legislation. Berkeley's elected Rent Board is solidly pro-tenant.